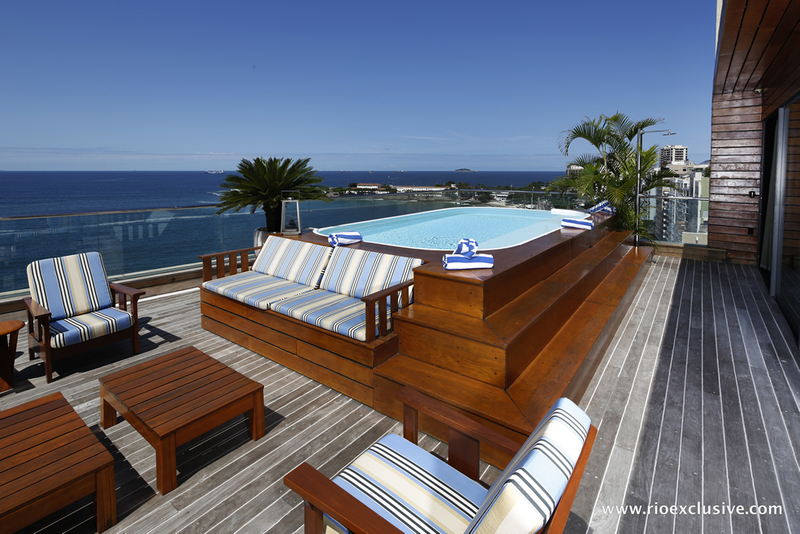 The ultimate in luxury living awaits for you at this 5 bedroom beachfront penthouse on Copacabana’s world famous Avenida Atlantica. 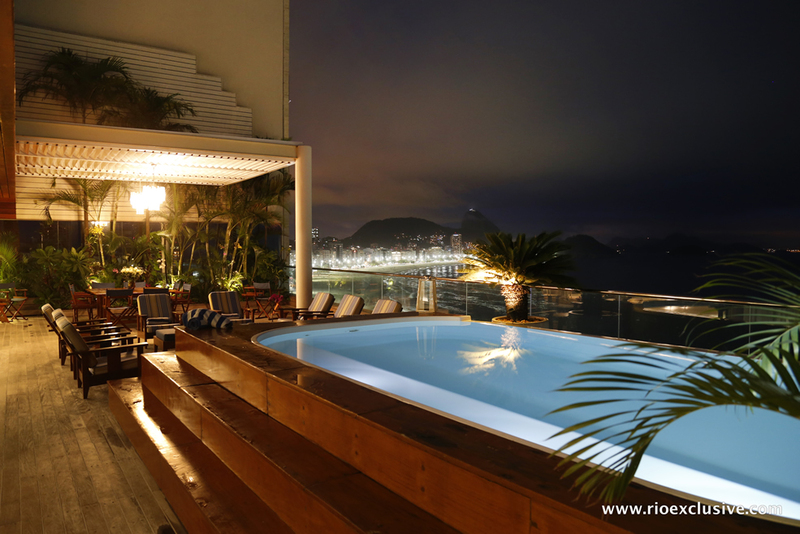 Astonishing views, an enormous terrace with its own pool, ample space for leisure and luxurious personal accommodations make this property one of the most elite and exclusive options in Rio de Janeiro. 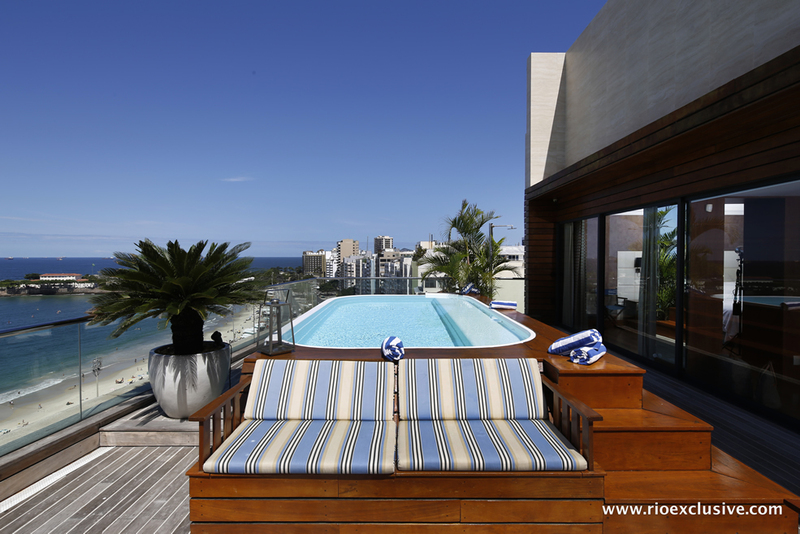 The ultimate in luxury living awaits you at this 5 bedroom beachfront vacation rental in Copacabana. 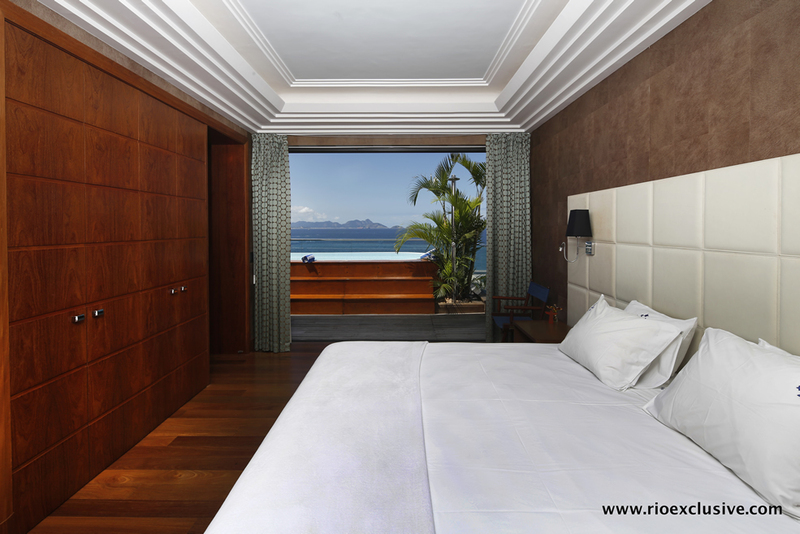 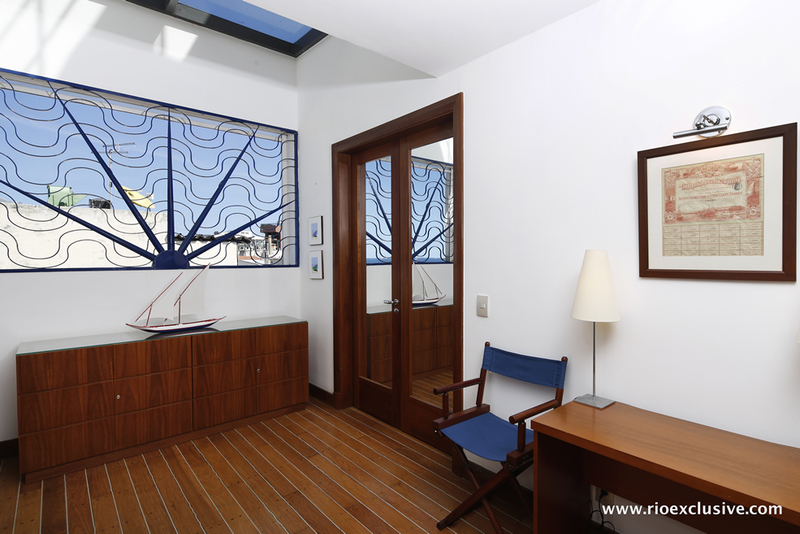 Astonishing views, an enormous terrace with its own pool, ample space for leisure and luxurious personal accommodations make this property one of the most elite and exclusive vacation options in Rio de Janeiro. 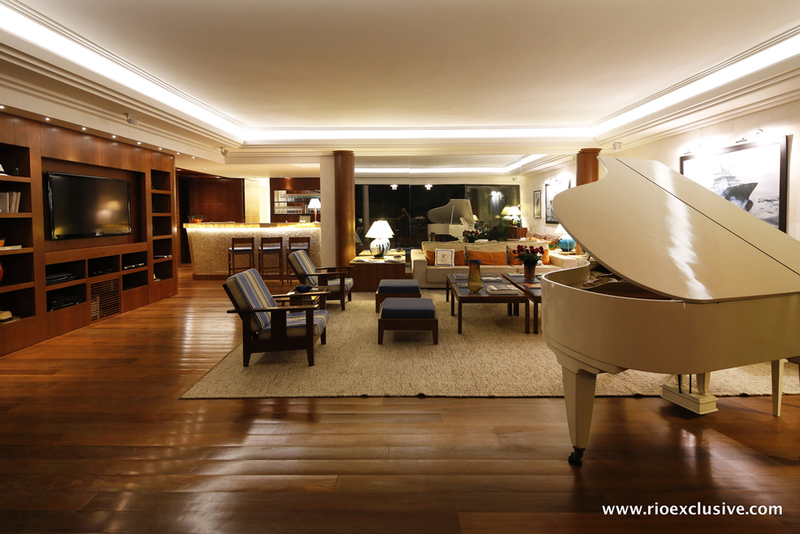 Entering the property your eyes will immediately be drawn to the spacious and well-furnished living room. 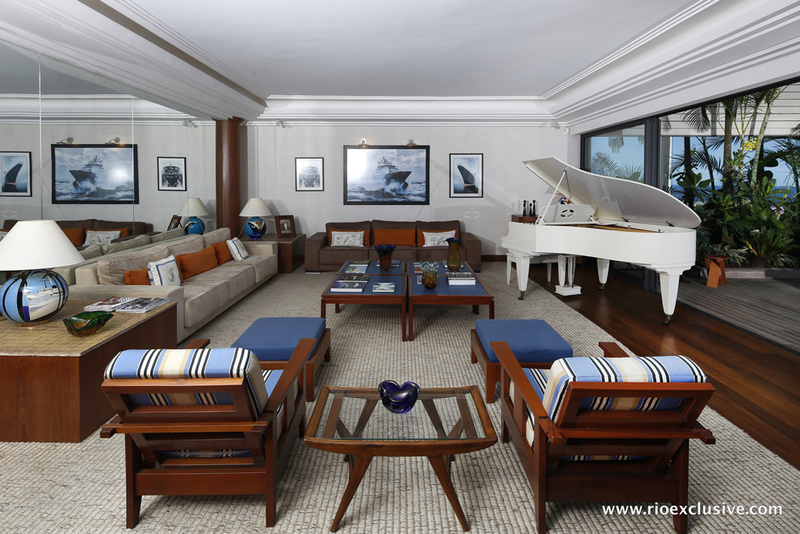 Two couches, three seats, and four tables await you in a tastefully decorated room with a naval theme. 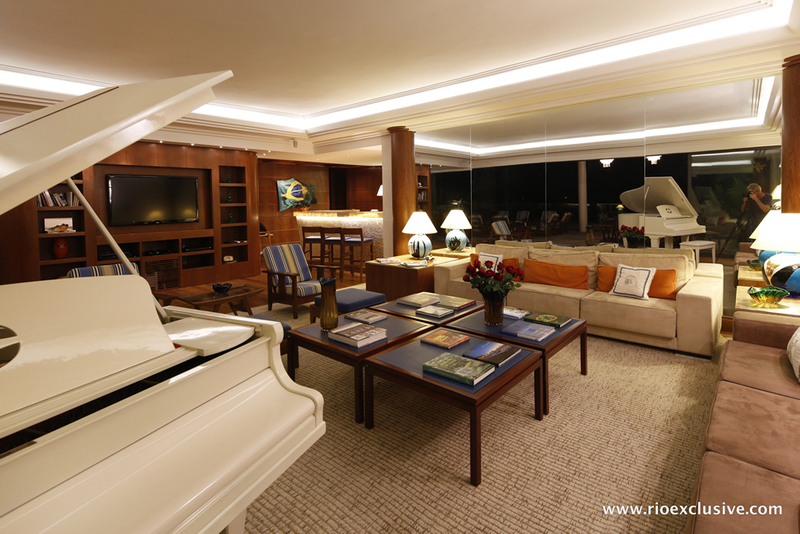 An excellent grand piano is there for you to play or have played. 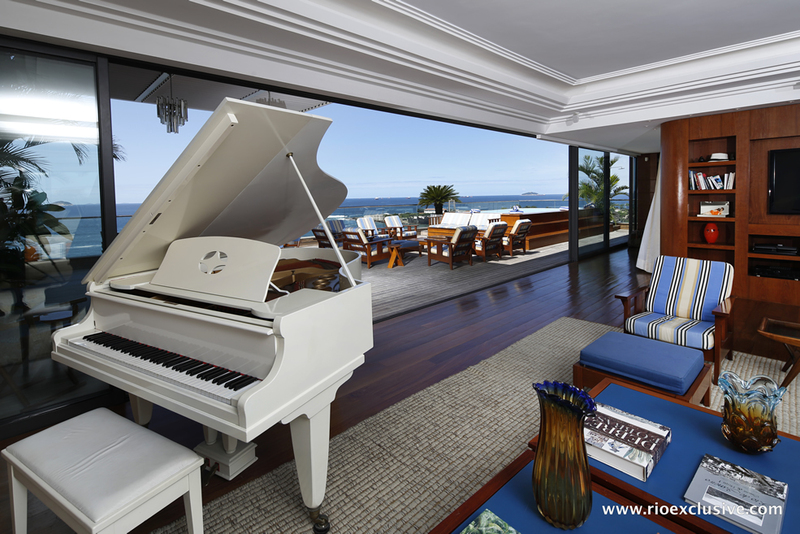 A wall-length set of glass doors separate the inside living room from the terrace creating the possibility of opening up the space to the outside and creating a huge indoor-outdoor leisure space. 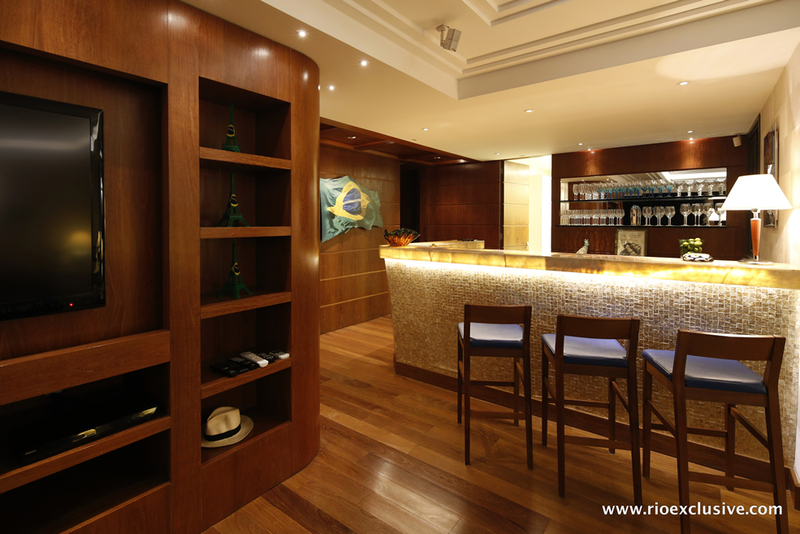 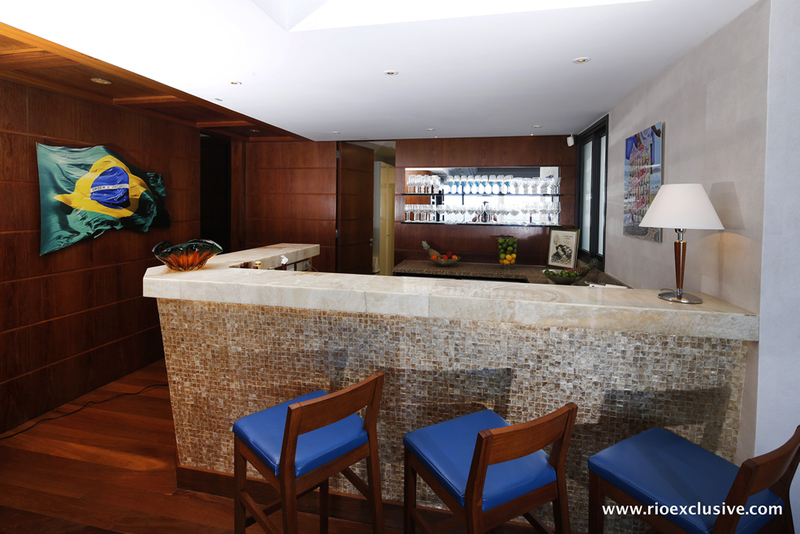 Next to the living room is a personal bar perfect for mixing an evening drink or for hosting large social gatherings. 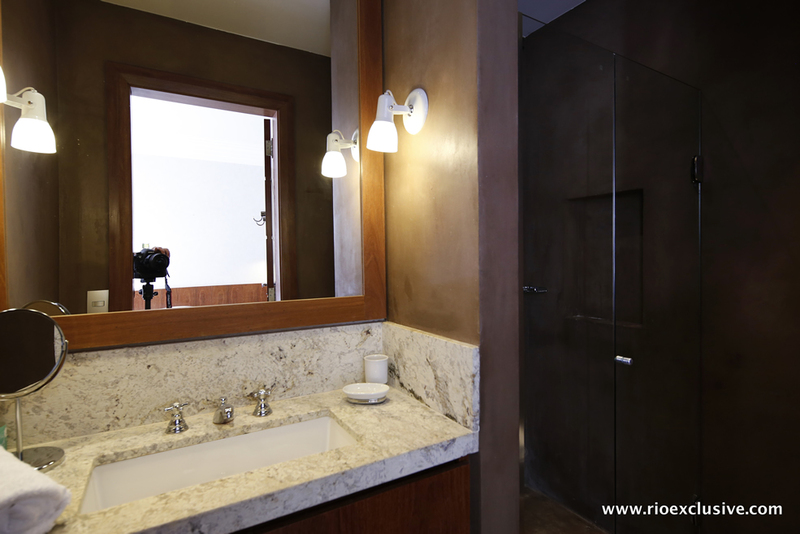 Elegantly designed and artfully lighted the space comes with modern appliances and ample room to prepare light snacks and refreshments as well. 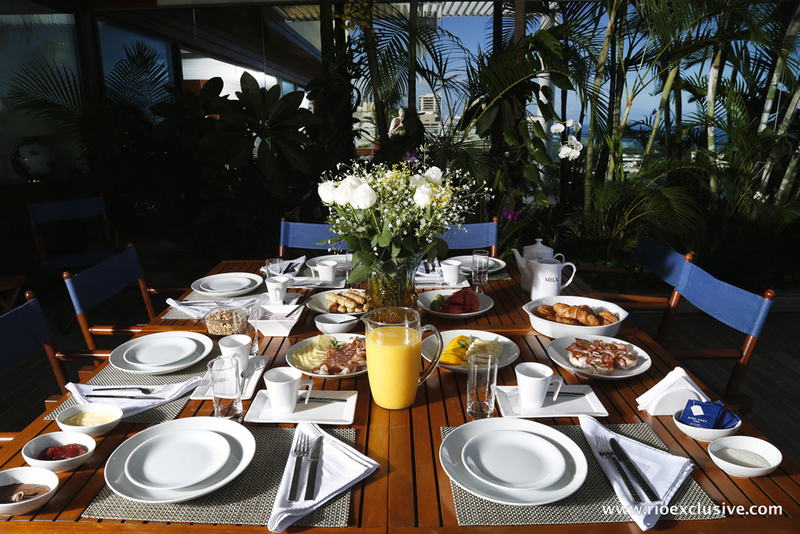 The main kitchen is an expansive area complete with everything needed for you or your personal team of service staff to prepare gourmet meals. 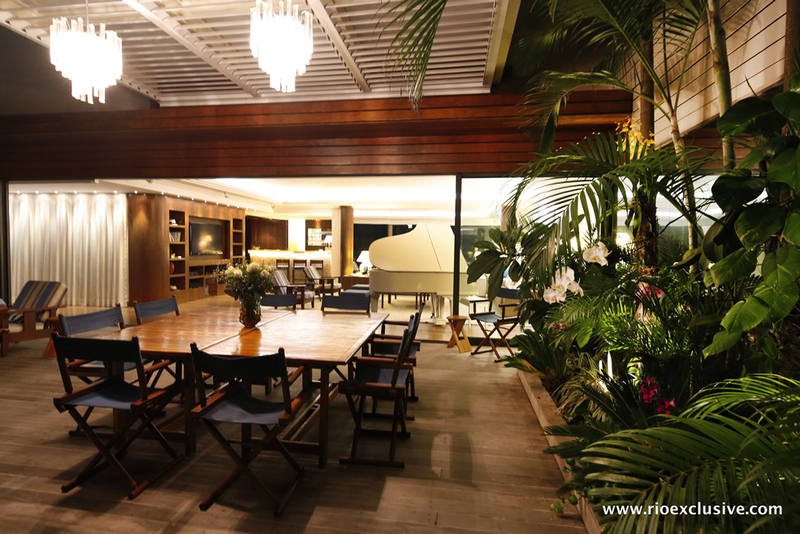 All the appliances, dining sets and equipment are from the very best international brands and will ensure you unmatched quality and reliability. 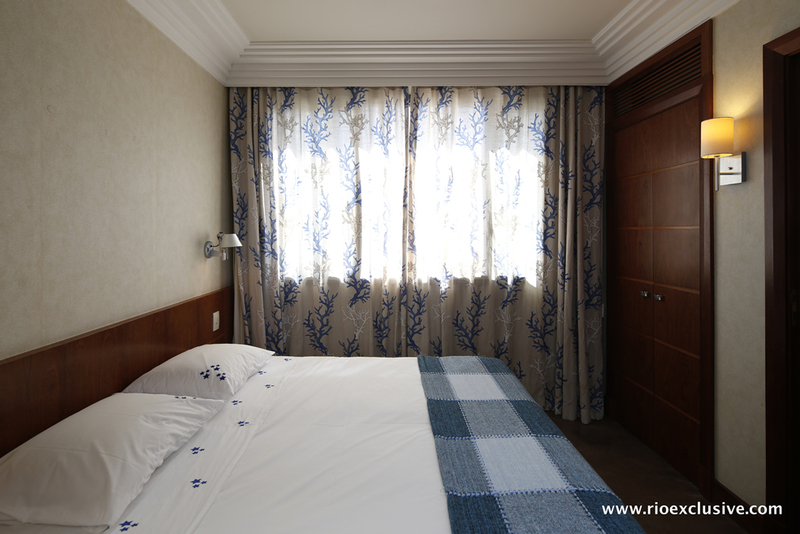 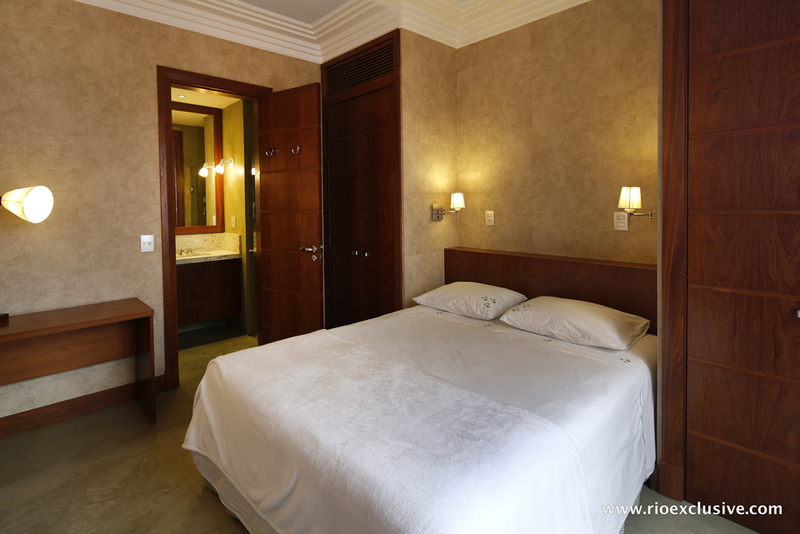 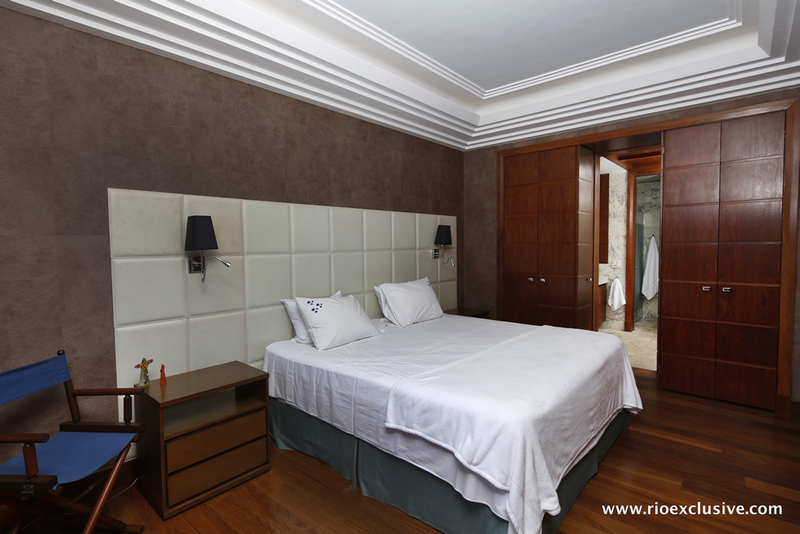 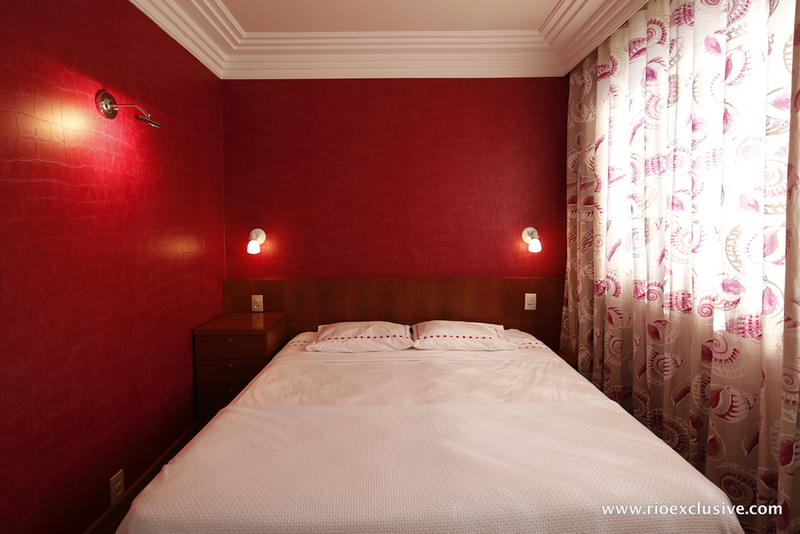 The 5 bedrooms are all equipped with luxury beds able to match those of any 5-star hotel; each comfortably capable of sleeping a couple in air-conditioned bliss. 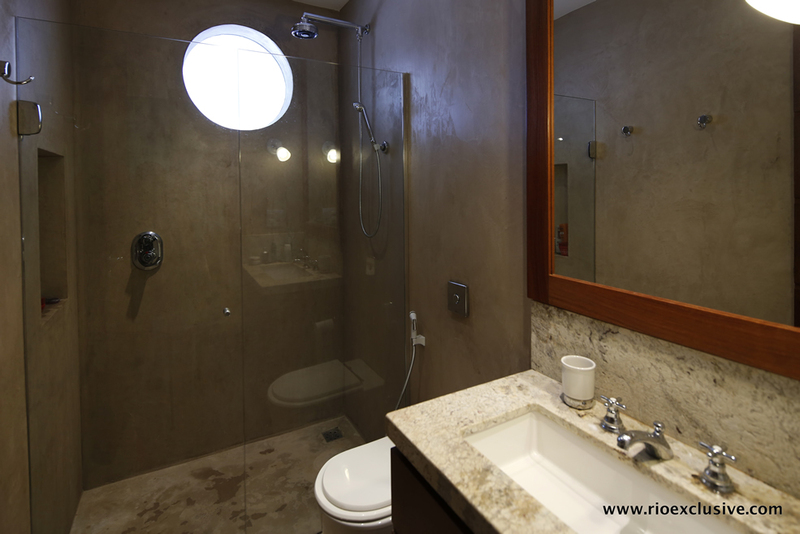 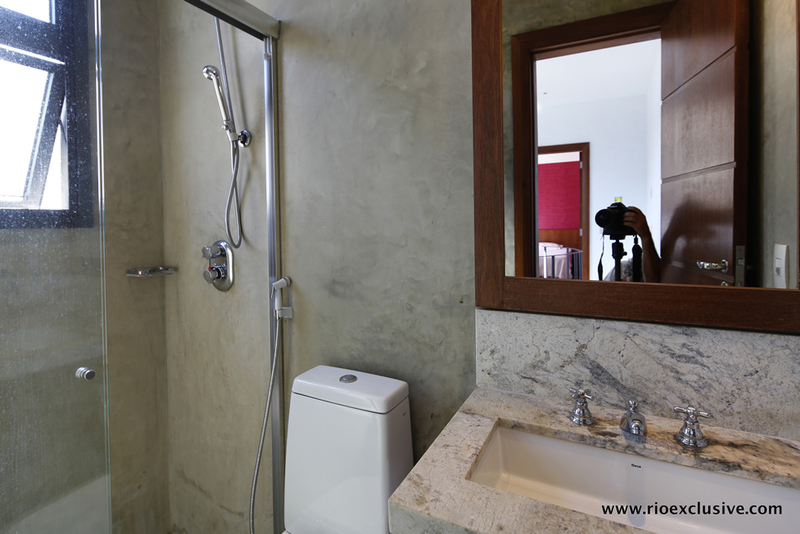 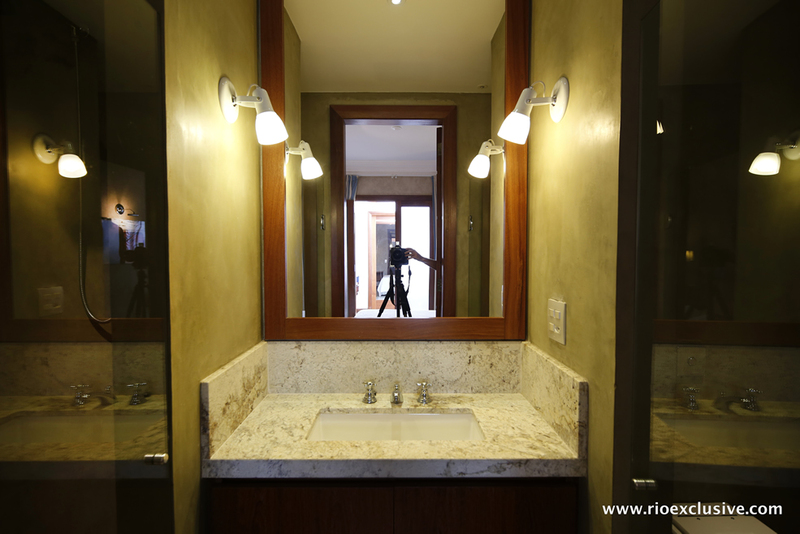 En-suite bathrooms ensure complete privacy and the luxury of having your own bath or shower available at any time. 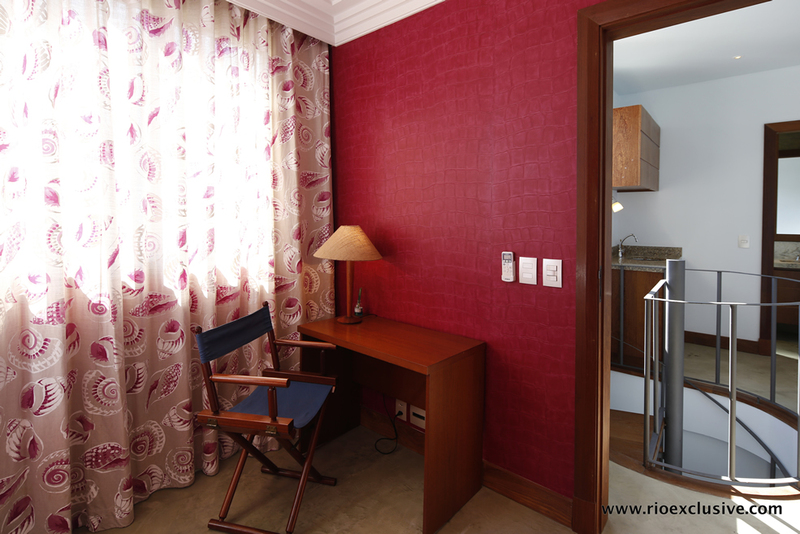 The suites share some smaller common areas perfect for sitting, reading or working in a more private location. 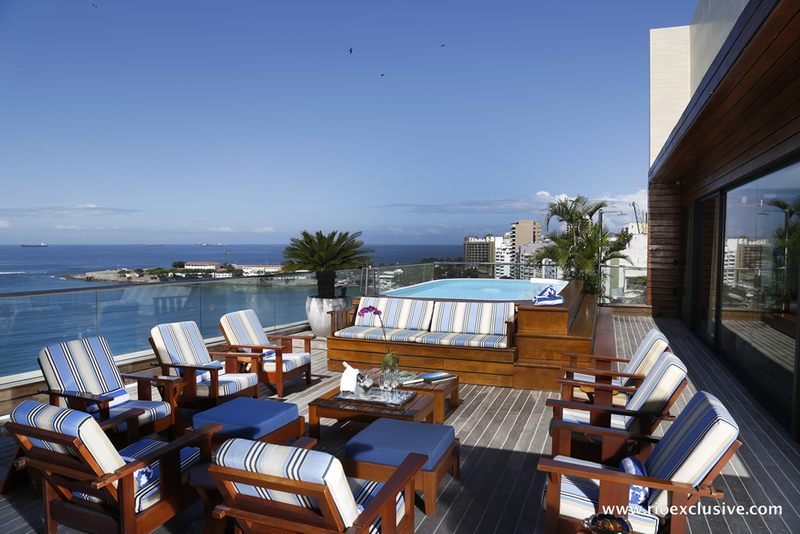 The terrace is the crown jewel of the property and what sets it in a class of its own. 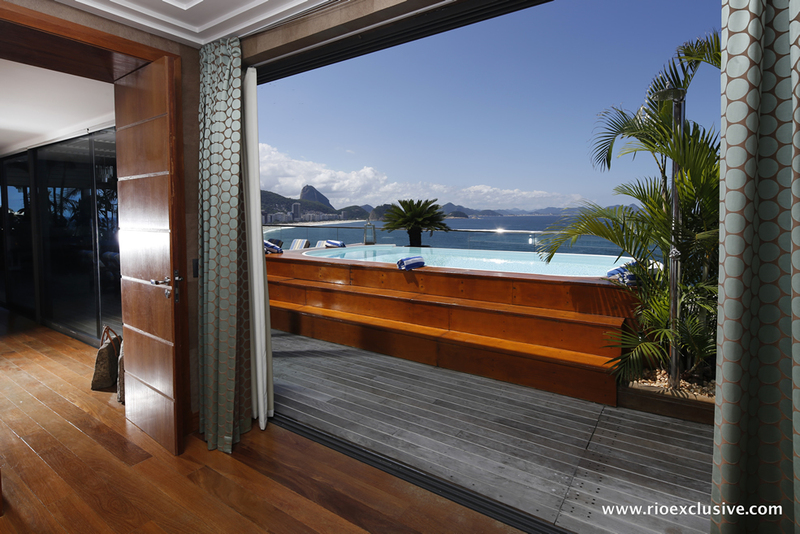 Stepping out on to the hardwood deck you’ll be able to see an unmatched view of all of Copacabana beach and the Guanabara Bay. 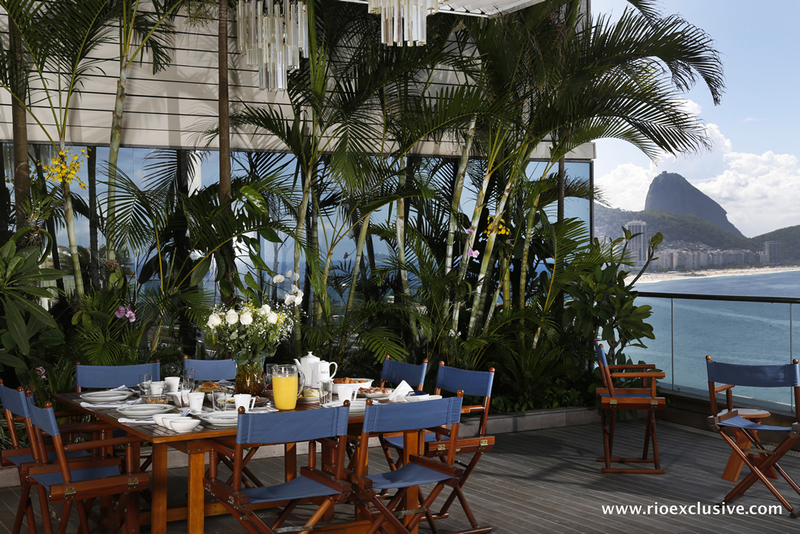 A sweeping glance will give you a panoramic view reaching from the old Copacabana fort to the mountains of Niteroi across the bay and finally resting by the stunning beauty of Leme Beach. 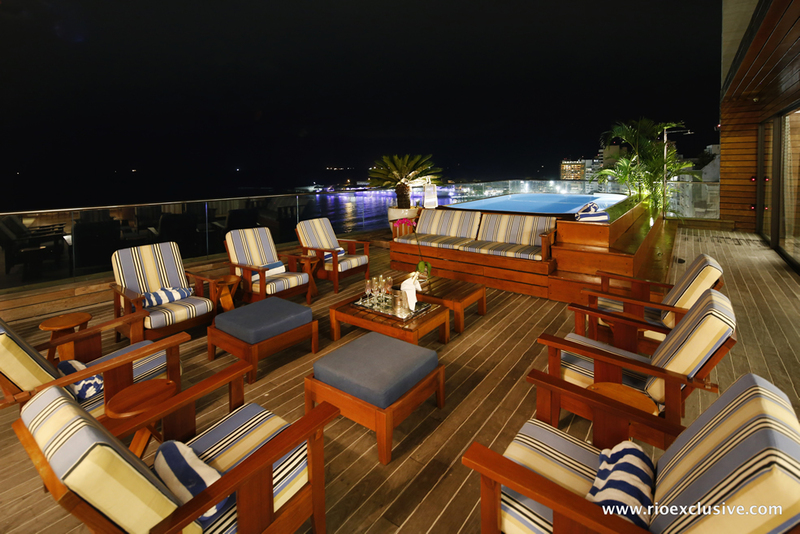 Far from only offering a view, the terrace gives you an unmatched space for resting, relaxing and hosting large social events. 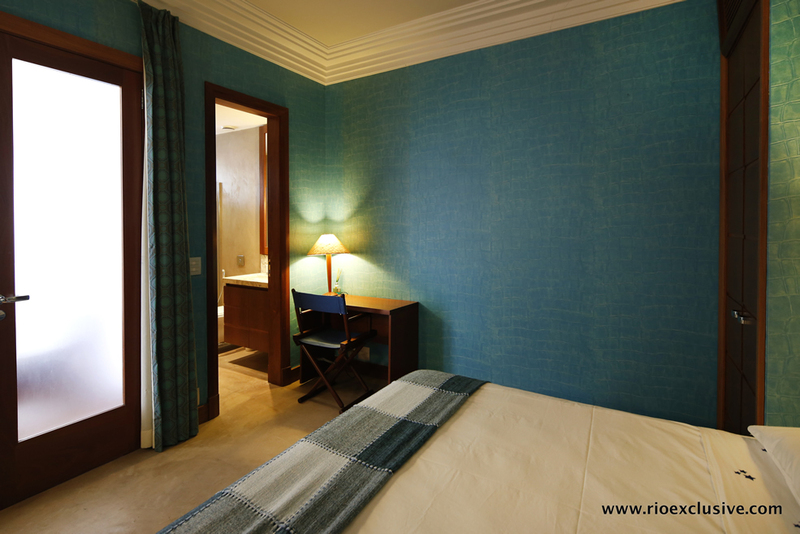 Ample seating ensures space for everyone. 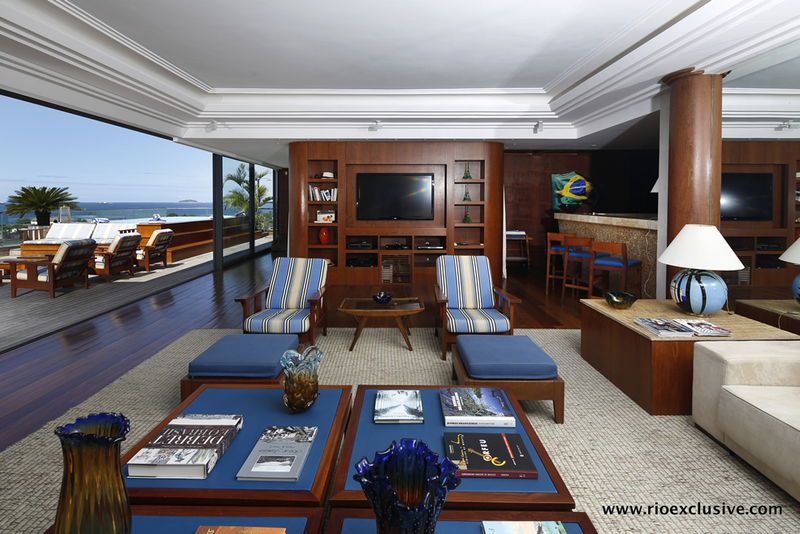 Whether you are stargazing at night or taking in the Rio sun during the day, you’ll be able to relax in style and in company. 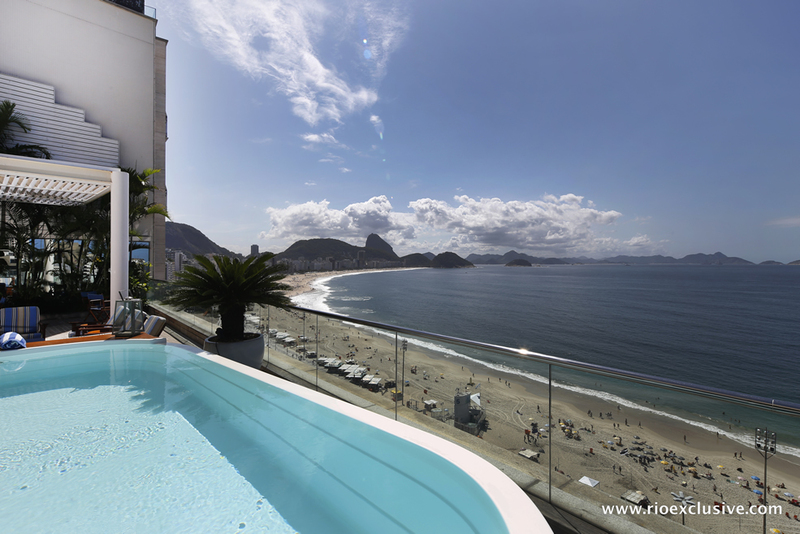 A large pool makes the perfect site for a mid-day or evening swim. 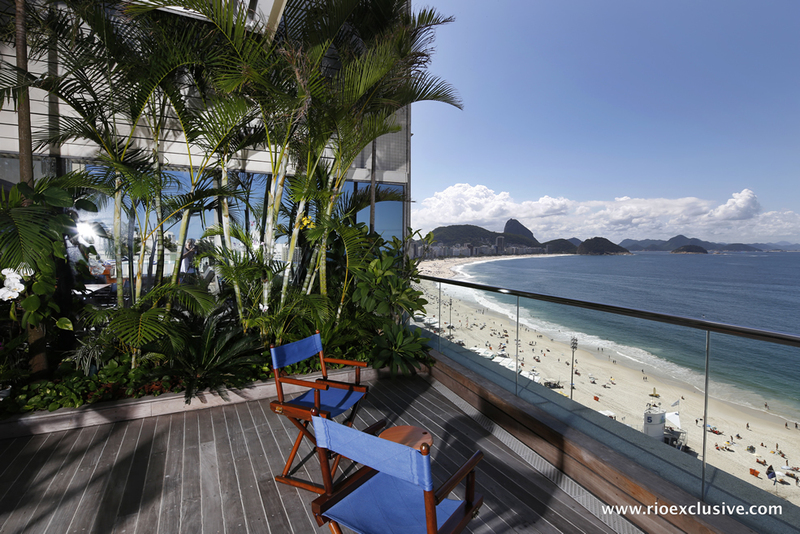 Whether enjoying the view by yourself or hosting a party of your friends and colleagues you’ll be hard-pressed to find a more fantastic and inspiring site than the one provided by this luxury penthouse. 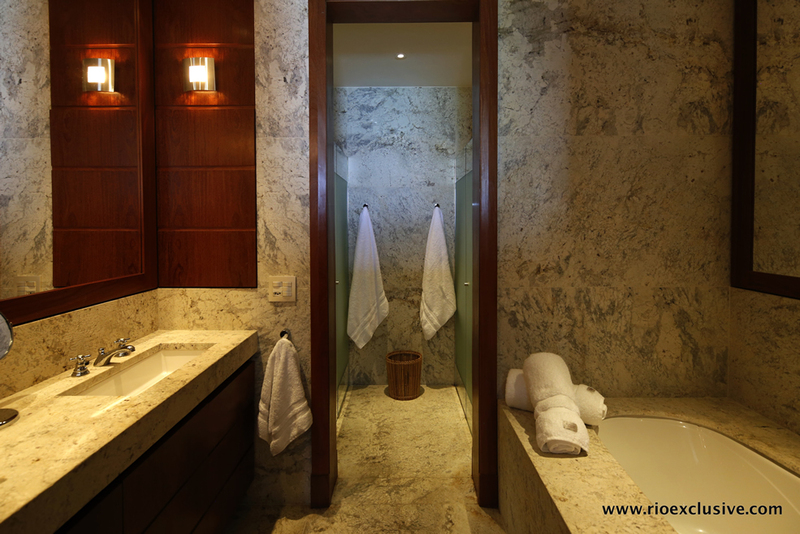 Like all our luxury properties, this penthouse comes with daily maid service from our in-house team. 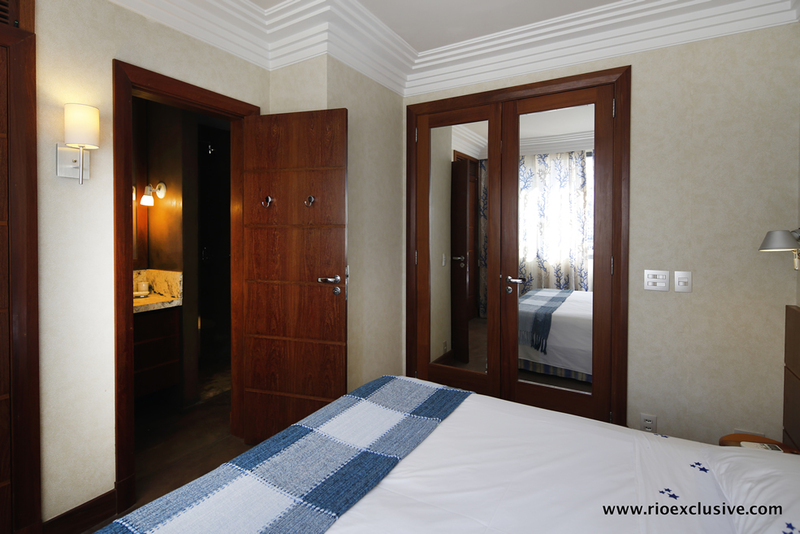 Our team of professional staff is happy to assist you in planning any of the many additional services which we offer our clients.